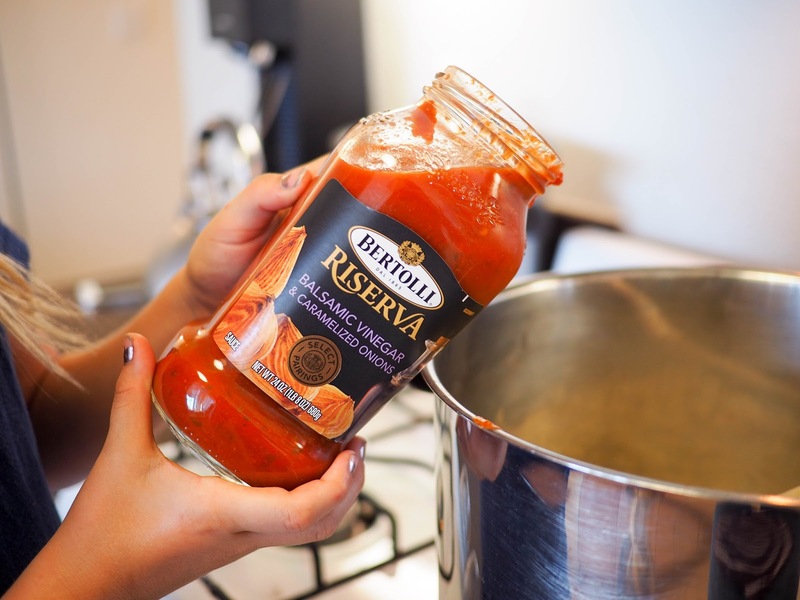 It's been a while since I shared a Cooking with Kids post so when the opportunity to work with Bertolli® (who this year are celebrating their 150th birthday) came up I knew it would be a great opportunity to get the kids back in the kitchen. Anyone who knows my kids, knows that they love Italian food. What kid doesn't? Pasta, pizza, gelato... What's not to love? After our trip to Tuscany back in 2012 Lola was absolutely obsessed with pasta. She wanted it for every meal - even breakfast! Well, when she wasn't asking for cake for breakfast, that is. Our farm stay in Tuscany had the most amazing continental breakfasts on offer, including freshly baked cake. Lola is still convinced that everyone in Italy eats cake for breakfast every day! Anyway, back to the pasta... 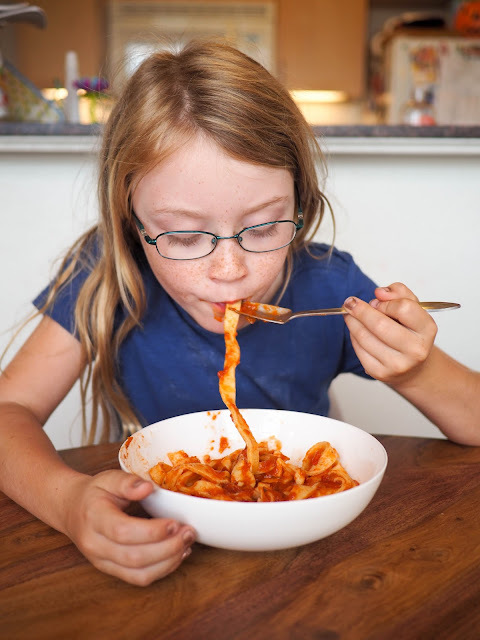 Pasta is such a quick and easy, yet delicious and satisfying, meal that we find ourselves eating it several times a week. There are so many tasty options out there and I've recently discovered the Bertolli® Riserva range which brings the tastes of Tuscany to our dining table. We usually cook with store bought dried pasta but for a change I thought the kids and I would try our hand at making our pasta from scratch. As much as I love pasta, I've actually only ever made it from scratch once before. And that turned into a massive sticky gnocchi food fight with a group of friends when one of them accidentally made mashed potatoes with the ingredients instead of just mashing the potatoes! So I've never successfully made pasta before - until now. 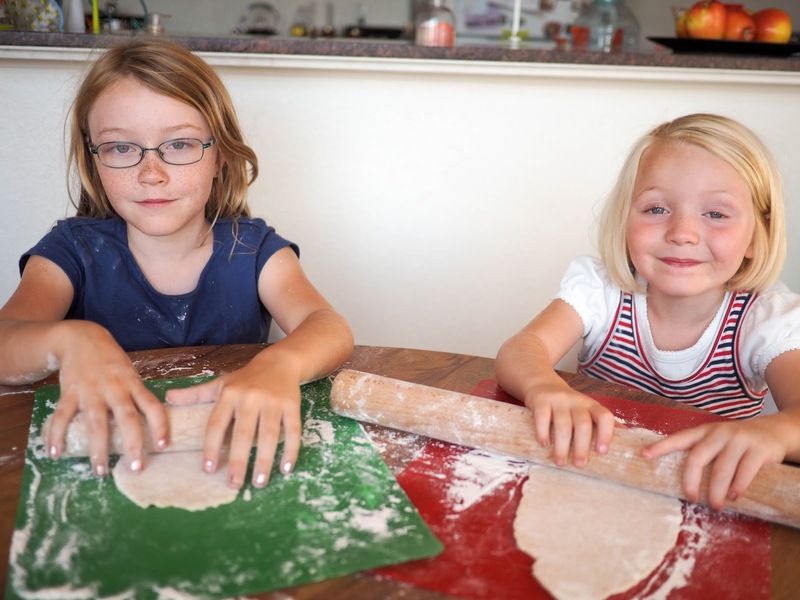 With my two little helpers by my side I set out to make fettuccine by hand, without a pasta roller or a food processor. It was a little bit of hard work (ie. lots of rolling) but in the end it was worth it. Sure, our noodles were a little fat, but cooked to al dente perfection they sure did taste good, especially when topped with Bertolli® Riserva Balsamic Vinegar & Caramelized Onions sauce. 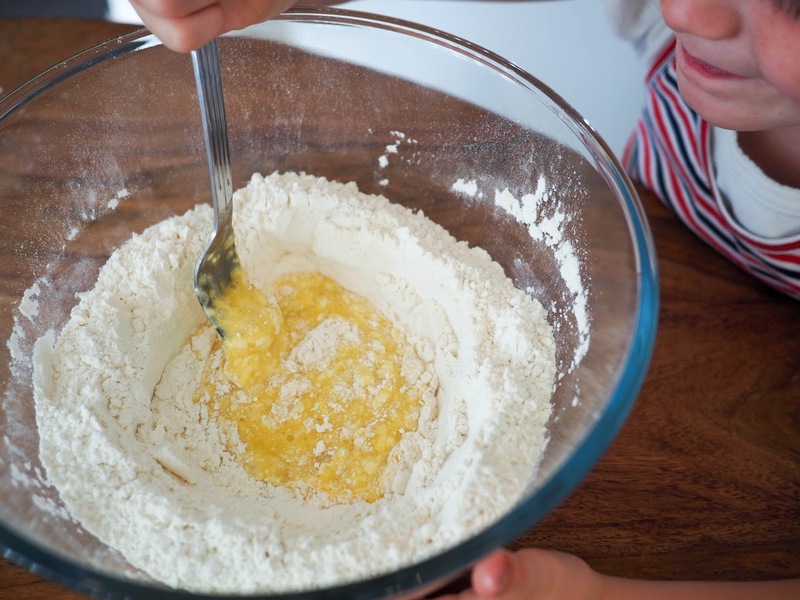 Start by whisking the flour and salt together with a fork in a medium sized mixing bowl. 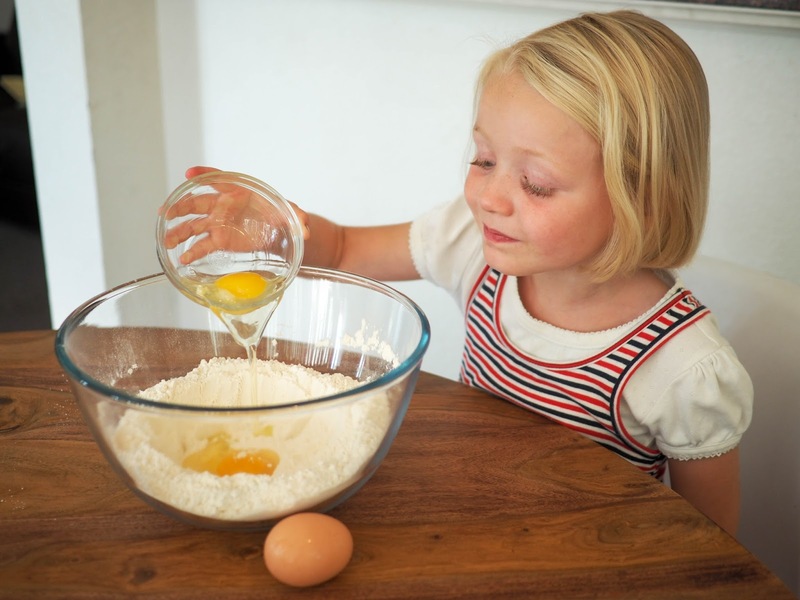 Make a deep well in the middle of the flour and add the eggs into the well. Whisk the eggs together with a fork. As you whisk the eggs, gradually start stirring in a little of the flour from the sides of the well. Slowly add in flour until a soft dough is formed. You may find that there is still flour left over. This is fine. Take the dough out of the bowl and place it on a floured surface. You can use any excess flour in the mixing bowl for this. The dough should be very soft at first. To prepare it for kneading, fold it over itself, flatten and then fold again. After a while of doing this the dough will be firm enough to knead. 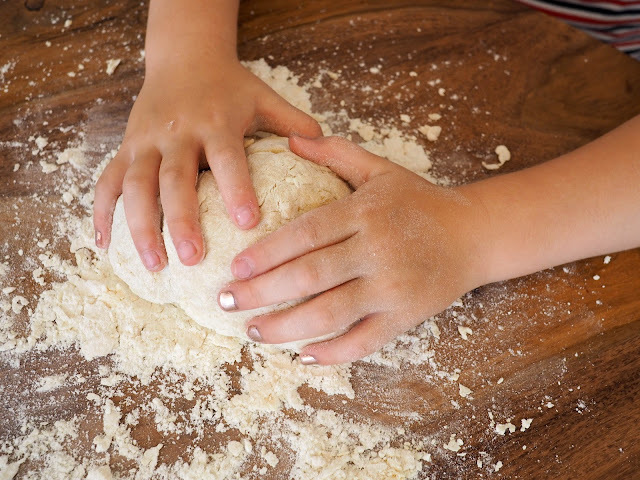 Incorporate more flour as needed if the dough sticks to your surface while you knead. 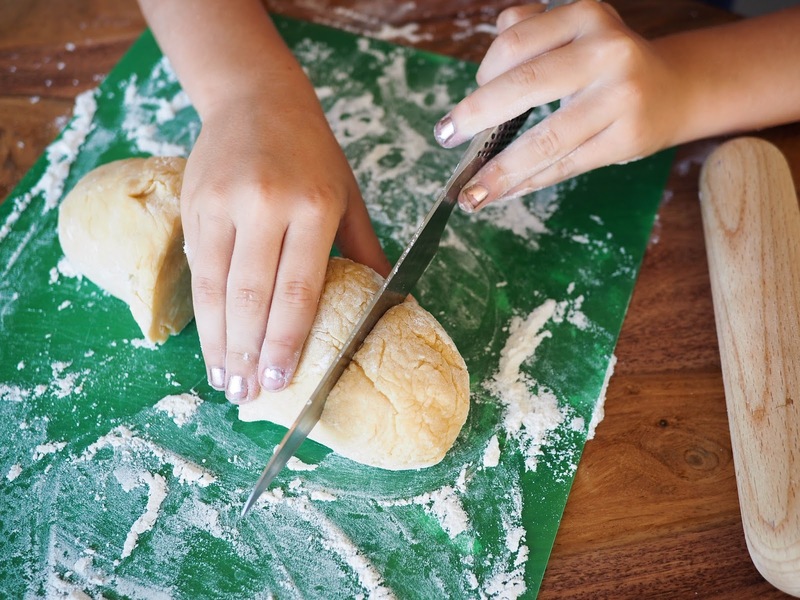 To check if the dough is done, form it into a ball and cut it in half with a sharp knife. If there are lots of bubbles in the dough it requires more kneading. Keep kneading until the are few bubbles left when the dough is cut. Once the dough is done, place it back in the (cleaned) mixing bowl and cover with a plate, cling wrap or a lid. Set aside for half an hour. After half an hour the dough is ready to be rolled. 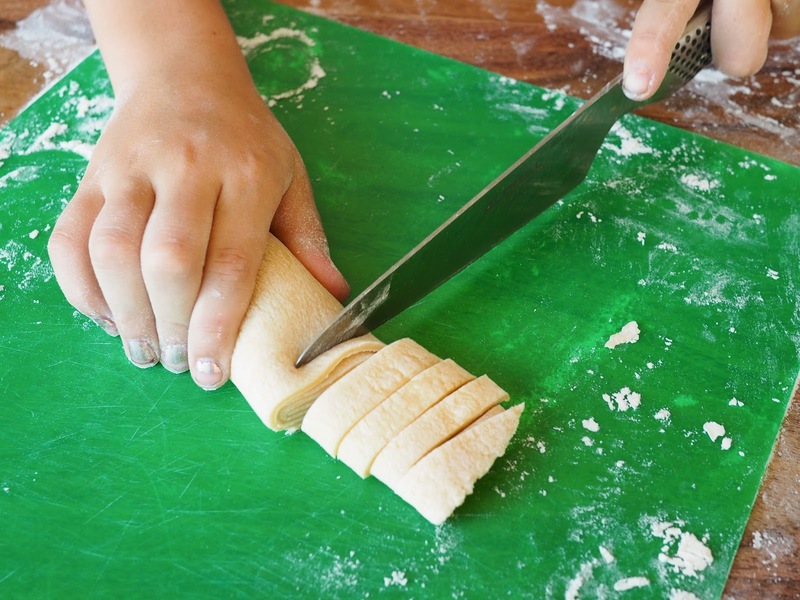 Form the dough into a long roll and cut into four pieces. Place the first piece onto a floured surface to be rolled and cover the other pieces in the bowl until you are ready to use them. To roll the pasta dough, flatten it out a little into a square shape. Place your rolling pin in the middle and roll forward. It is important to roll in just one direction at a time. Roll forward, lift the rolling pin up and bring it back to the middle, and roll forward again. Repeat. To roll the other side, lift the dough of your surface and turn it around so that the unrolled side is facing away from you. 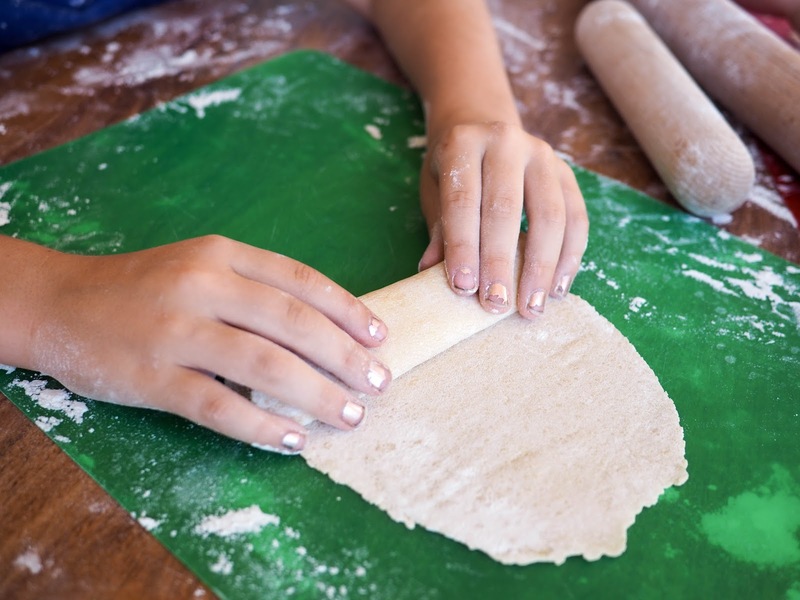 Place the rolling pin in the middle and roll forward again in the same manner as before. Continue rolling and turning the pasta until it is quite thin. This may take some time - especially if you have kids wielding the rolling pin - but trust me, it's worth it. Once you are happy with the thickness of the pasta dough carefully fold it over about 1 inch from the short end. Continue to fold along the length of the dough until it is all folded up. 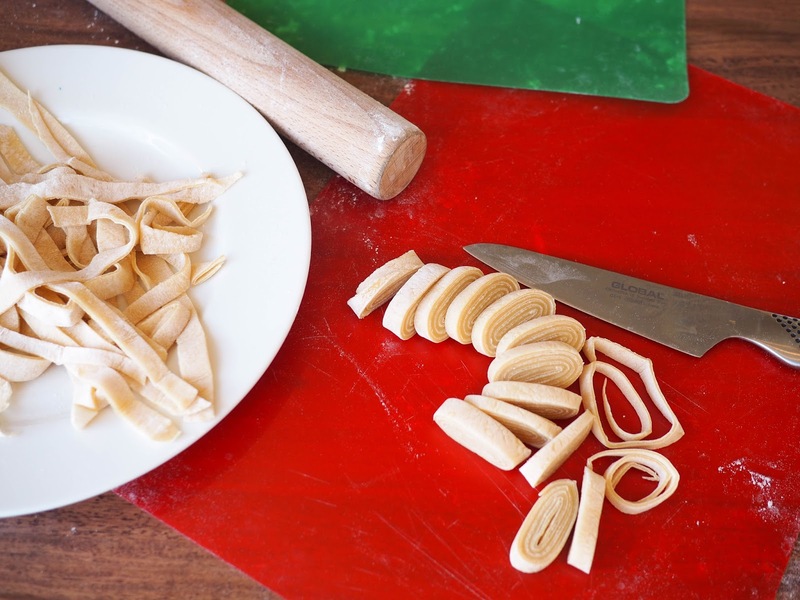 Take a sharp knife and cut the folded pasta dough into strips. You can cut them as narrow or as wide as you like. Aim for consistency to ensure that the pasta cooks evenly. Shake the cut pieces of pasta dough out onto a plate or tray. You can now either cook the pasta straight away or leave it to dry out for later use. We chose to eat ours fresh. If you'd prefer to dry your pasta, hang it over a clothes drying rack, coat hanger or back of a chair until it is brittle. You can then store it in an airtight container for up to a few weeks. To cook the pasta, boil a pot of salted water. Add the pasta once the water boils rapidly.The pasta should be al dente in about 4 -5 minutes. 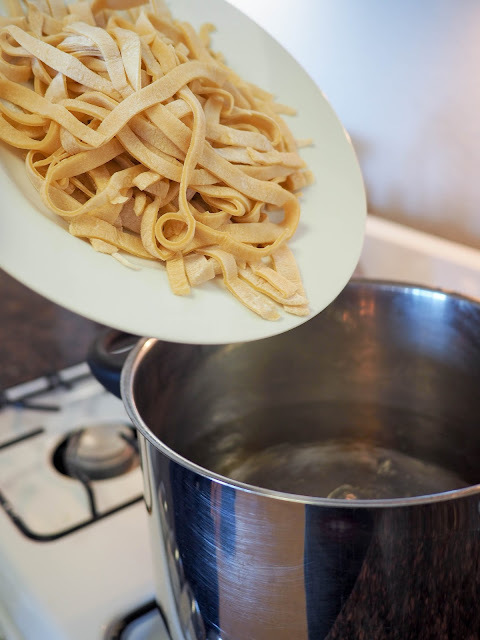 Drain the cooking water and return the pasta to the pan. Add your preferred sauce and stir through to heat. 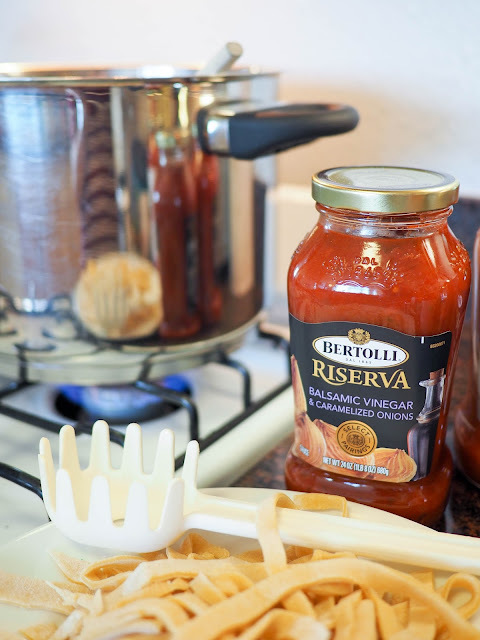 We chose Bertolli® Riserva Balsamic Vinegar & Caramelized Onions. 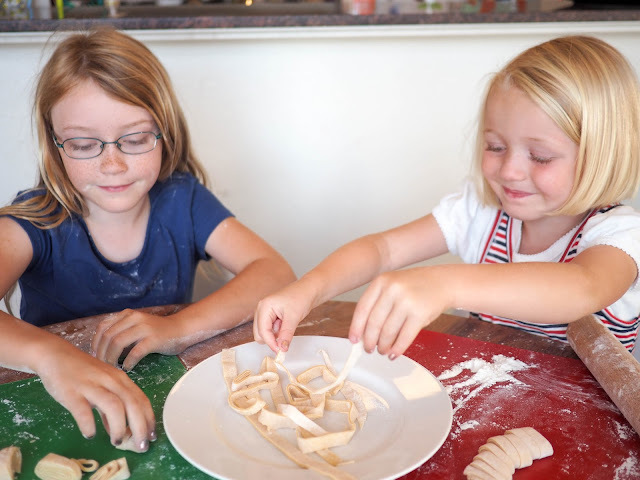 The girls and I enjoyed making our own pasta so much that we'll definitely be doing it again. There's something satisfying about knowing that we made the pasta ourselves - even if we did cheat with the sauce! 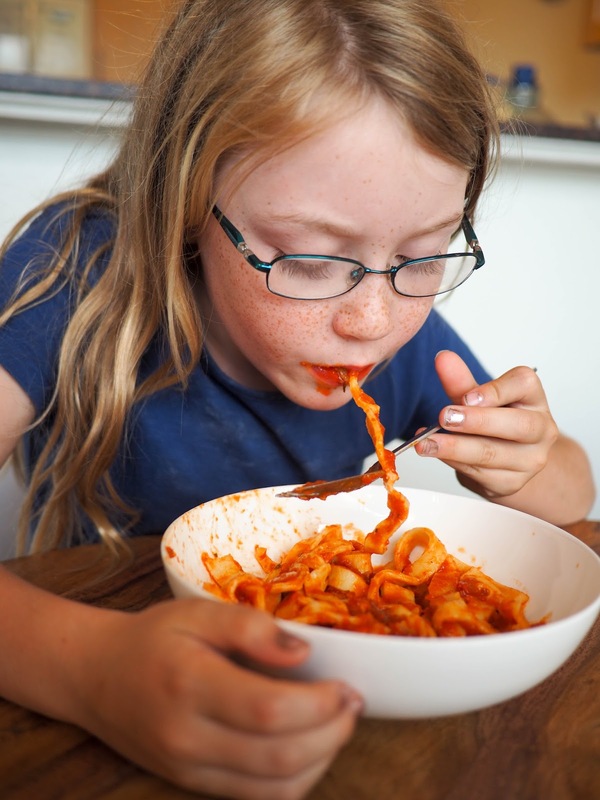 Throughout October Bertolli® are partnering with No Kid Hungry to help end childhood hunger in America. For each photo shared in October via social media using #MyTuscanTable, Bertolli® will make a $1 donation to No Kid Hungry. With each dollar, No Kid Hungry will provide 10 healthy meals to kids in need, up to a half a million meals. No Kid Hungry is ending childhood hunger in America by ensuring kids have the healthy food they need, every day. 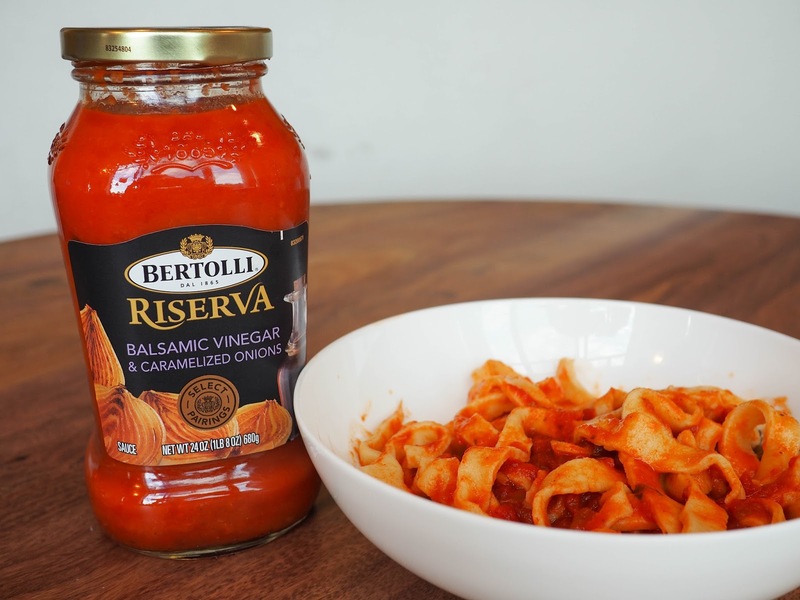 The Bertolli® brand is proud to lend its passion for uniting people over food to help connect kids struggling with hunger to the nutritious meals they need to grow and thrive. 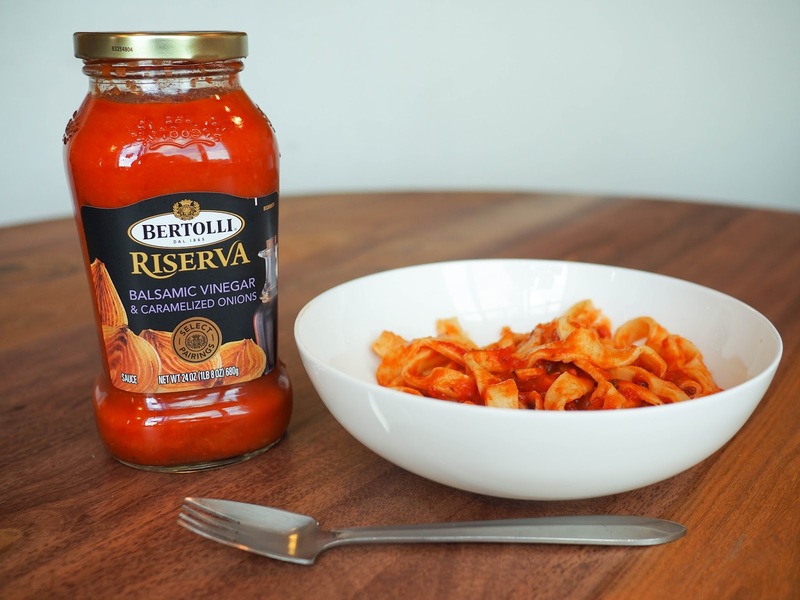 Make sure to share your Tuscan table using #MyTuscanTable and join Bertolli® in helping to end childhood hunger in the U.S. with No Kid Hungry! Visit VivaBertolli.com for more inspiration. So fun! I have always wanted to make my own pasta! You guys make it look easy!